Traumatic brain injury (TBI) is a major public health problem and the leading cause of death and disability worldwide. Approximately 1.7 million people sustain TBI every year in the United States, leading to 275,000 hospitalizations and 52,000 deaths. TBI is a contributing factor in about 30.5% of all injury-related deaths in the United States. TBI occurs most often in children aged 0-4 years, adolescents aged 15-19 years and elderly aged 65 years and more. In all age groups, males have a higher rate of TBI than females. Falls and motor vehicle-traffic injury are the leading causes of TBI in the United States. In the recent years, prehospital and intensive care of patients with TBI has improved substantially and evidence-based guidelines for management have been developed. ,,,,,,,,,,, However, despite the modern diagnosis and treatment, the prognosis for patients with TBI remains poor, emphasizing the need for further research and improvement in care. This review will focus on the perioperative management of TBI, with particular emphasis on recent developments, and is based on extensive Pubmed and Medline search on various aspects of perioperative management of TBI, followed by review of research focusing on intraoperative and perioperative period. Given the poor outcomes of TBI and impact of secondary insults, current TBI management focuses on prevention of primary injury and avoidance of secondary injuries. Thus, the cornerstones of modern TBI management are field resuscitation, expeditious triage, emergent surgical evacuation of mass lesions, control of ICP, and support of CPP, multimodal monitoring and optimization of physiological environment. Perioperative period may be particularly important in the course of TBI management for numerous reasons. First, despite the aggressive interventions to rapidly correct hypoxemia, hypotension, hypo and hypercarbia, and hypo and hyperglycemia in the emergency department, it is not unusual for one or more of these complicating factors to persist or remain undetected as the patient is emergently transported to the operating room. Hence, perioperative period may provide an opportunity to either continue ongoing resuscitation or to correct the pre-existing secondary insults. Secondly, surgery and anesthesia may predispose the patient to new onset secondary injuries (such as intraoperative hypotension due to surgical blood loss or effect of anesthetic agents, new onset hyperglycemia due to stress response, etc. ), which may contribute adversely to outcomes. Since secondary injury is largely preventable/treatable, the perioperative period may be a potential window to initiate interventions that may improve the outcome of TBI. Perioperative management involves rapid evaluation, continuation of resuscitation (cerebral and systemic), early surgical intervention, intensive monitoring and anesthetic planning. The initial assessment and stabilization is usually achieved in the emergency department and resuscitation initiated before the patient is transported to Computed Tomography (CT) scanner and then to the operating room. Nevertheless, it is important for the anesthesia team to perform another rapid assessment as the patient is received in the operating room. The assessment should always begin with airway, breathing and circulation, followed by a rapid assessment of neurological status and associated extracranial injuries and attention to specific secondary injury mechanisms and ongoing treatment thereof. Information about time and mechanism of injury can be valuable. Brief neurological assessment is performed by using Glasgow Coma Scale (GCS)  score and pupillary responses. Associated thoracic, abdominal, spinal and long bone injuries may be stable or evolve during the perioperative period and must be considered in differential diagnosis of new onset hypotension, anemia, hemodynamic instability or hypoxemia during anesthesia and surgery. As the patient is transported to the operating room, all resuscitative measures should continue. The choice of technique for tracheal intubation is determined by urgency, individual expertise/skills and available resources and generally incorporates rapid sequence intubation with cricoid pressure and manual in-line stabilization. The anterior portion or cervical collar may be removed when manual in-line stabilization is established to allow greater mouth opening and facilitate laryngoscopy. Newer airway devises, particularly Glidescope videolaryngoscope, have gained popularity in recent years for use in trauma victims and may be useful in difficult airway scenarios. However, the intubation time using Glidescope may be longer due to difficulty in passing the tracheal tube through the glottis despite easier visualization. Nasal intubation should be avoided in patients with base of skull fracture, severe facial fractures or bleeding diathesis. In any case, it is advisable to have a back-up plan ready in case of difficult intubation, given the significant risk of intracranial hypertension resulting from increased cerebral blood volume (CBV) because of hypoxemia and hypercarbia. provide adequate analgesia and amnesia. Vasopressors are commonly administered to treat hypotension or to augment CPP. However, there are only a few studies comparing the effectiveness of commonly used vasopressors in TBI and results of these studies are conflicting. Human data explicitly comparing vasopressors are limited to three small prospective, randomized, crossover trials comparing sequential effectiveness between norepinephrine and dopamine. Despite there being no differences in mean cerebral flow velocity , and cerebral oxygenation or metabolism  between the two vasopressors, norepinephrine had more predictable and consistent effect  while dopamine use led to higher ICP. A recent single-center retrospective study of patients with severe TBI who received phenylephrine, norepinephrine or dopamine reported maximum increase in MAP and CPP from baseline with phenypephrine use. There was no difference in ICP between the treatment groups after initiating the vasopressor although it was unclear whether improved MAP/CPP with vasopressor use translated into improved CBF or oxygenation. Current evidence does not support preference of one vasopressor over the other. Anemia is associated with increased in-hospital mortality  and poor outcome in TBI. , Yet, there is little evidence to support packed red blood cell (PRBC) transfusion practice standards to correct anemia in TBI. While some have suggested that patients with TBI may not benefit from a higher transfusion threshold than other critically ill patients,  others have cautioned against the liberal use of blood transfusion in TBI. Potential mechanisms of cerebral injury due to anemia include tissue hypoxia, injury caused by reactive oxygen species, inflammation, disruption of blood-brain barrier (BBB) function, vascular thrombosis and anemic cerebral hyperemia. However, a number of cerebroprotective physiological mechanisms become effective with anemia which include aortic chemoreceptor activation, increased sympathetic activity leading to increased heart rate, stroke volume and cardiac index, reduced systemic vascular resistance, and enhanced oxygen extraction. Moreover, a number of cellular mechanisms of cerebral protection become effective in acute anemia. These include Hypoxia Inducible Factor (HIF), increased nitric oxide synthetase and nitric oxide in the brain (nNOS/NO), erythropoietin and vascular endothelial growth factor (VEGF) mediated angiogenesis and vascular repair. Although increase in CBF during acute anemia can improve oxygen delivery, high hematocrit after PRBC transfusion may potentially decrease CBF and increase the risk of cerebral ischemia. However, anemia due to hemodilution may impair cerebral autoregulation. The overall effects of anemia on the brain might, therefore, depend on the relative balance between these competing protective and harmful factors of anemia and PRBC transfusion, and it is unclear whether transfusion trigger in patients with TBI should be any different from other critically ill patients and whether the injured brain is more susceptible to deleterious effects of anemia. Hence, tight glucose control with intensive insulin therapy remains controversial. While a number of studies have investigated hyperglycemia in adult TBI in different contexts (admission vs. ICU, transient vs. persistent, early vs. late, etc. ), none has specifically addressed the intraoperative period and the prevalence of intraoperative hyperglycemia, and its relation to preoperative glycemic patterns in adult TBI is not known. Since hyperglycemia is attributed to a stress response from the initial injury , and blood glucose levels are known to increase under anesthesia even in non-diabetic patients,  it is possible that added stress during general anesthesia and surgery may worsen hyperglycemia and contribute to poor outcome. Moreover, individual anesthetic agents have been shown to have differential effects on blood and brain glucose levels. , The only perioperative study in children with TBI demonstrated that intraoperative hyperglycemia is common, hypoglycemia in the absence of insulin treatment is not rare, and TBI severity and the presence of subdural hematoma (SDH) predict intraoperative hyperglycemia. In the author's experience in adult patients undergoing craniotomy for TBI, intraoperative hyperglycemia (glucose > 200 mg/dl) was common (15%) and hypoglycemia (glucose < 60 mg/dl) was not observed (unpublished data). We also found that the independent risk factors for intraoperative hyperglycemia were severe TBI, SDH, preoperative hyperglycemia, and age ≥65 years, and the in-hospital mortality was higher in patients with intraoperative hyperglycemia. Given the current evidence for glucose control for TBI in perioperative period, a target glucose range of 80-180 mg/dl seems reasonable. Perioperative period may be important in TBI management. While it may predispose the patient to new onset secondary injuries which may contribute adversely to outcomes, it is also an opportunity to detect and correct the undiagnosed pre-existing secondary insults. It may also be a potential window to initiate interventions that may improve the outcome of TBI. While research focused specifically on the intraoperative and perioperative TBI management is awaited, clinical management will continue to be based on physiological optimization. Level I recommendations are based on the strongest evidence for effectiveness, and represent principles of patient management that reflect high degree of clinical certainty. Level II recommendations reflect a moderate degree of clinical certainty. For level III recommendations, the degree of clinical certainty is not established. 1. Faul M, Xu L, Wald MM, Coronado VG. Traumatic brain injury in the United States: Emergency department visits, hospitalizations, and deaths. Atlanta (GA): Centers for Disease Control and Prevention, National Center for Injury Prevention and Control; 2010. 2. Bratton SL, Chestnut RM, Ghajar J, McConnell Hammond FF, Harris OA, Hartle R, et al. Brain Trauma Foundation; American Association of Neurological Surgeons; Congress of Neurological Surgeons; Joint Section on Neurotrauma and Critical Care, AANS/CNS. Guidelines for the management of severe traumatic brain injury. I. Blood pressure and oxygenation. J Neurotrauma 2007;24:S7-13. 3. Bratton SL, Chestnut RM, Ghajar J, McConnell Hammond FF, Harris OA, Hartle R, et al. Brain Trauma Foundation; American Association of Neurological Surgeons; Congress of Neurological Surgeons; Joint Section on Neurotrauma and Critical Care, AANS/CNS. Guidelines for the management of severe traumatic brain injury. II. Hyperosmolar therapy. J Neurotrauma 2007;24:S14-20. 4. Bratton SL, Chestnut RM, Ghajar J, McConnell Hammond FF, Harris OA, Hartl R, et al. Brain Trauma Foundation; American Association of Neurological Surgeons; Congress of Neurological Surgeons; Joint Section on Neurotrauma and Critical Care, AANS/CNS. Guidelines for the management of severe traumatic brain injury. III. Prophylactic hypothermia. J Neurotrauma 2007;24:S21-5. 5. Bratton SL, Chestnut RM, Ghajar J, McConnell Hammond FF, Harris OA, Hartl R, et al. Brain Trauma Foundation; American Association of Neurological Surgeons; Congress of Neurological Surgeons; Joint Section on Neurotrauma and Critical Care, AANS/CNS. Guidelines for the management of severe traumatic brain injury. VI. 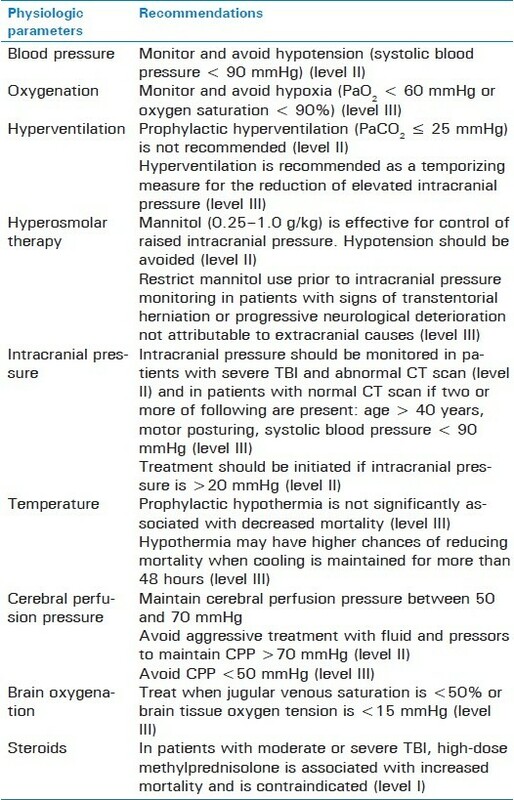 Indications for intracranial pressure monitoring. J Neurotrauma 2007;24:S37-44. 6. Bratton SL, Chestnut RM, Ghajar J, McConnell Hammond FF, Harris OA, Hartl R, et al. Brain Trauma Foundation; American Association of Neurological Surgeons; Congress of Neurological Surgeons; Joint Section on Neurotrauma and Critical Care, AANS/CNS. Guidelines for the management of severe traumatic brain injury. VII. Intracranial pressure monitoring technology. J Neurotrauma 2007;24:S45-54. 7. Bratton SL, Chestnut RM, Ghajar J, McConnell Hammond FF, Harris OA, Hartl R, et al. Brain Trauma Foundation; American Association of Neurological Surgeons; Congress of Neurological Surgeons; Joint Section on Neurotrauma and Critical Care, AANS/CNS. Guidelines for the management of severe traumatic brain injury. VIII. Intracranial pressure thresholds. J Neurotrauma 2007;24:S55-8. 8. Bratton SL, Chestnut RM, Ghajar J, McConnell Hammond FF, Harris OA, Hartl R, et al. Brain Trauma Foundation; American Association of Neurological Surgeons; Congress of Neurological Surgeons; Joint Section on Neurotrauma and Critical Care, AANS/CNS. Guidelines for the management of severe traumatic brain injury. IX. Cerebral perfusion thresholds. J Neurotrauma 2007;24:S59-64. 9. Bratton SL, Chestnut RM, Ghajar J, McConnell Hammond FF, Harris OA, Hartl R, et al. Brain Trauma Foundation; American Association of Neurological Surgeons; Congress of Neurological Surgeons; Joint Section on Neurotrauma and Critical Care, AANS/CNS. Guidelines for the management of severe traumatic brain injury. X. Brain oxygen monitoring and thresholds. J Neurotrauma 2007;24:S65-70. 10. Bratton SL, Chestnut RM, Ghajar J, McConnell Hammond FF, Harris OA, Hartl R, et al. Brain Trauma Foundation; American Association of Neurological Surgeons; Congress of Neurological Surgeons; Joint Section on Neurotrauma and Critical Care, AANS/CNS. Guidelines for the management of severe traumatic brain injury. XI. Anesthetics, analgesics, and sedatives. J Neurotrauma 2007;24:S71-6. 11. Bratton SL, Chestnut RM, Ghajar J, McConnell Hammond FF, Harris OA, Hartl R, et al. Brain Trauma Foundation; American Association of Neurological Surgeons; Congress of Neurological Surgeons; Joint Section on Neurotrauma and Critical Care, AANS/CNS. Guidelines for the management of severe traumatic brain injury. XIII. Antiseizure prophylaxis. J Neurotrauma 2007;24:S83-6. 12. Bratton SL, Chestnut RM, Ghajar J, McConnell Hammond FF, Harris OA, Hartl R, et al. Brain Trauma Foundation; American Association of Neurological Surgeons; Congress of Neurological Surgeons; Joint Section on Neurotrauma and Critical Care, AANS/CNS. Guidelines for the management of severe traumatic brain injury. XIV. Hyperventilation. J Neurotrauma 2007;24:S87-90. 14. Greve MW, Zink BJ. Pathophysiology of traumatic brain injury. Mt Sinai J Med 2009;76:97-104. 15. Werner C, Engelhard K. Pathophysiology of traumatic brain injury. Br J Anaesth 2007;99:4-9. 16. Chesnut RM, Marshall LF, Klauber MR, Blunt BA, Baldwin N, Eisenberg HM, et al. The role of secondary brain injury in determining outcome from severe head injury. J Trauma 1993;34:216-22. 17. Marshall LF, Becker DP, Bowers SA, Cayard C, Eisenberg H, Gross CR, et al. The National Traumatic Coma Data Bank. Part 1: Design, purpose, goals, and results. J Neurosurg 1983;59:276-84. 18. McHugh GS, Engel DC, Butcher I, Steyerberg EW, Lu J, Mushkudiani N, et al. Prognostic value of secondary insults in traumatic brain injury: Results from the IMPACT study. J Neurotrauma. 2007;24:287-93. 19. Pietropaoli JA, Rogers FB, Shackford SR, Wald SL, Schmoker JD, Zhuang J. The deleterious effects of intraoperative hypotension on outcome in patients with severe head injuries. J Trauma 1992;33:403-7. 20. Liu-DeRyke X, Collingridge DS, Orme J, Roller D, Zurasky J, Rhoney DH. Clinical impact of early hyperglycemia during acute phase of traumatic brain injury. Neurocrit Care 2009;11:151-7. 21. Jeremitsky E, Omert LA, Dunham CM, Wilberger J, Rodriguez A. The impact of hyperglycemia on patients with severe brain injury. J Trauma 2005;58:47-50. 22. Griesdale DE, Tremblay MH, McEwen J, Chittock DR. Glucose Control and Mortality in Patients with Severe Traumatic Brain Injury. Neurocrit Care 2009;11:311-6. 23. Sharma D, Jelacic J, Chennuri R, Chaiwat O, Chandler W, Vavilala MS. Incidence and risk factors for perioperative hyperglycemia in children with traumatic brain injury. Anesth Analg 2009;108:81-9. 24. Warner KJ, Cuschieri J, Copass MK, Jurkovich GJ, Bulger EM. The impact of prehospital ventilation on outcome after severe traumatic brain injury. J Trauma 2007;62:1330-6. 25. Dumont TM, Visioni AJ, Rughani AI, Tranmer BI, Crookes B. Inappropriate prehospital ventilation in severe traumatic brain injury increases in-hospital mortality. J Neurotrauma 2010;27:1233-41. 26. Teasdale G, Jennett B. Assessment of coma and impaired consciousness. A practical scale. Lancet 1974;2:81-4. 27. Crosby ET. Airway management in adults after cervical spine trauma. Anesthesiology 2006;104:1293-318. 28. Holly LT, Kelly DF, Counelis GJ, Blinman T, McArthur DL, Cryer HG. Cervical spine trauma associated with moderate and severe head injury: Incidence, risk factors, and injury characteristics. J Neurosurg (Spine 3) 2002;96:285-291. 29. Demetriades D, Charalambides K, Chahwan S, Hanpeter S, Alo K, Velmahos, G, et al. Nonskeletal cervical spine injuries: Epidemiology and diagnostic pitfalls. J Trauma 2000;48:724-7. 30. Platts-Mills TF, Campagne D, Chinnock B, Snowden B, Glickman LT, Hendey GW. A comparison of GlideScope video laryngoscopy versus direct laryngoscopy intubation in the emergency department. Acad Emerg Med 2009;16:866-71. 31. Dearden NM, McDowall DG. Comparison of etomidate and althesin in the reduction of increased intracranial pressure after head injury. Br J Anaesth 1985;57:361-8. 32. Cohan P, Wang C, McArthur DL, Cook SW, Dusick JR, Armin B, et al. Acute secondary adrenal insufficiency after traumatic brain injury: A prospective study. Crit Care Med 2005;33:2358-66. 33. Schulte am Esch J, Pfeifer G, Thiemig I, Entzian W. The influence of intravenous anaesthetic agents on primarily increased intracranial pressure. Acta Neurochir (Wien) 1978;45:15-25. 34. Perry JJ, Lee JS, Sillberg VA, Wells GA. Rocuronium versus succinylcholine for rapid sequence induction intubation. Cochrane Database Syst Rev 2008;2:CD002788. 35. Minton MD, Grosslight K, Stirt JA, Bedford RF. Increases in intracranial pressure from succinylcholine: Prevention by prior nondepolarizing blockade. Anesthesiology 1986;65:165-9. 36. Stirt JA, Grosslight KR, Bedford RF, Vollmer D. Defasciculation" with metocurine prevents succinylcholine-induced increases in intracranial pressure. Anesthesiology 1987;67:50-3. 37. Kovarik WD, Mayberg TS, Lam AM, Mathisen TL, Winn HR. Succinylcholine does not change intracranial pressure, cerebral blood flow velocity, or the electroencephalogram in patients with neurologic injury. Anesth Analg 1994;78:469-73. 38. Clancy M, Halford S, Walls R, Murphy M. In patients with head injuries who undergo rapid sequence intubation using succinylcholine, does pretreatment with a competitive neuromuscular blocking agent improve outcome? A literature review. Emerg Med J 2001;18:373-5. 39. Turner BK, Wakim JH, Secrest J, Zachary R. Neuroprotective effects of thiopental, propofol, and etomidate. AANA J 2005;73:297-302. 40. Schregel W, Weyerer W, Cunitz G. Opioids, cerebral circulation and intracranial pressure. Anaesthesist 1994;43:421-30. 41. Engelhard K, Werner C. Inhalational or intravenous anesthetics for craniotomies? Pro inhalational. Curr Opin Anaesthesiol 2006;19:504-8. 42. Schulte am Esch J, Thiemig I, Pfeifer G, Entzian W. The influence of some inhalation anaesthetics on the intracranial pressure with special reference to nitrous oxide. Anaesthesist 1979;28:136-41. 43. Schaffranietz L, Heinke W. The effect of different ventilation regimes on jugular venous oxygen saturation in elective neurosurgical patients. Neurol Res 1998;20:S66-70. 44. Myburgh J, Cooper DJ, Finfer S, Bellomo R, Norton R, Bishop N, et al. SAFE Study Investigators; Australian and New Zealand Intensive Care Society Clinical Trials Group; Australian Red Cross Blood Service; George Institute for International Health. Saline or albumin for fluid resuscitation in patients with traumatic brain injury. N Engl J Med 2007;357:874-84. 45. Baker AJ, Rhind SG, Morrison LJ, Black S, Crnko NT, Shek PN, et al. Resuscitation with hypertonic saline-dextran reduces serum biomarker levels and correlates with outcome in severe traumatic brain injury patients. J Neurotrauma 2009;26;1227-40. 46. Cooper DJ, Myles PS, McDermott FT, Murray LJ, Laidlaw J, Cooper G, et al. Prehospital hypertonic saline resuscitation of patients with hypotension and severe traumatic brain injury: A randomized controlled trial. JAMA 2004;291:1350-7. 47. Ract C, Vigué B. Comparison of the cerebral effects of dopamine and norepinephrine in severely head-injured patients. Intensive Care Med 2001;27:101-6. 48. Steiner LA, Johnston AJ, Czosnyka M, Chatfield DA, Salvador R, Coles JP, et al. Direct comparison of cerebrovascular effects of norepinephrine and dopamine in head-injured patients. Crit Care Med 2004;32:1049-54. 49. Johnston AJ, Steiner LA, Chatfield DA, Coles JP, Hutchinson PJ, Al-Rawi PG, et al. Effect of cerebral perfusion pressure augmentation with dopamine and norepinephrine on global and focal brain oxygenation after traumatic brain injury. Intensive Care Med 2004;30:791-7. 50. Sookplung P, Siriussawakul A, Malakouti A, Sharma D, Wang J, Souter MJ, et al. Vasopressor Use and Effect on Blood Pressure After Severe Adult Traumatic Brain Injury. Neurocrit Care. 2010. 51. Alvarez M, Nava JM, Rué M, Quintana S. Mortality prediction in head trauma patients: Performance of Glasgow Coma Score and general severity systems. Crit Care Med 1998;26:142-8. 52. Carlson AP, Schermer CR, Lu SW. Retrospective evaluation of anemia and transfusion in traumatic brain injury. J Trauma 2006;61:567-71. 53. Salim A, Hadjizacharia P, DuBose J, Brown C, Inaba K, Chan L, et al. Role of anemia in traumatic brain injury. J Am Coll Surg 2008;207:398-406. 54. Hare GM, Tsui AK, McLaren AT, Ragoonanan TE, Yu J, Mazer CD. Anemia and cerebral outcomes: Many questions, fewer answers. Anesth Analg 2008;107:1356-70. 55. Pendem S, Rana S, Manno EM, Gajic O. A review of red cell transfusion in the neurological intensive care unit. Neurocrit Care 2006;4:63-7. 56. Ogawa Y, Iwasaki K, Aoki K, Shibata S, Kato J, Ogawa S. Central hypervolemia with hemodilution impairs dynamic cerebral autoregulation. Anesth Analg 2007;105:1389-96. 57. Leal-Noval SR, Múñoz-Gómez M, Murillo-Cabezas F. Optimal hemoglobin concentration in patients with subarachnoid hemorrhage, acute ischemic stroke and traumatic brain injury. Curr Opin Crit Care 2008;14:156-62. 58. Martini J, Carpentier B, Chávez Negrete A, Cabrales P, Tsai AG, Intaglietta M. Beneficial effects due to increasing blood and plasma viscosity. Clin Hemorheol Microcirc 2006;35:51-7. 59. Leal-Noval SR, Rincón-Ferrari MD, Marin-Niebla A, Cayuela A, Arellano-Orden V, Marín-Caballos A, et al. Transfusion of erythrocyte concentrates produces a variable increment on cerebral oxygenation in patients with severe traumatic brain injury: A preliminary study. Intensive Care Med 2006;32:1733-40. 60. Zygun DA, Nortje J, Hutchinson PJ, Timofeev I, Menon DK, Gupta AK. The effect of red blood cell transfusion on cerebral oxygenation and metabolism after severe traumatic brain injury. Crit Care Med 2009;37:1074-8. 61. Sharma D, Vavilala MS. Transfusion improves cerebral oxygenation. but not always. Crit Care Med 2009;37:1166-7. 62. Sharma D, Vavilala MS. Should brain tissue oxygenation be the transfusion trigger in traumatic brain injury? Pediatr Crit Care Med 2010;11:420-1. 63. Chaiwat O, Lang JD, Vavilala MS, Wang J, MacKenzie EJ, Jurkovich GJ, et al. Early packed red blood cell transfusion and acute respiratory distress syndrome after trauma. Anesthesiology 2009;110:351-60. 64. Vincent JL, Baron JF, Reinhart K, Gattinoni L, Thijs L, Webb A, et al; ABC (Anemia and Blood Transfusion in Critical Care) Investigators. Anemia and blood transfusion in critically ill patients. JAMA 2002;288:1499-507. 65. Malone DL, Dunne J, Tracy JK, Putnam AT, Scalea TM, Napolitano LM. Blood transfusion, independent of shock severity, is associated with worse outcome in trauma. J Trauma 2003;54:898-905. 66. Harhangi BS, Kompanje EJ, Leebeek FW, Maas AI. Coagulation disorders after traumatic brain injury. Acta Neurochir (Wien) 2008;150:165-75. 67. Talving P, Benfield R, Hadjizacharia P, Inaba K, Chan LS, Demetriades D. Coagulopathy in severe traumatic brain injury: A prospective study. J Trauma 2009;66:55-61. 68. Perel P, Roberts I, Shakur H, Thinkhamrop B, Phuenpathom N, Yutthakasemsunt S. Haemostatic drugs for traumatic brain injury. Cochrane Database Syst Rev 2010;1:CD007877. 69. CRASH-2 trial collaborators, Shakur H, Roberts I, Bautista R, Caballero J, Coats T, Dewan Y, et al. Effects of tranexamic acid on death, vascular occlusive events, and blood transfusion in trauma patients with significant haemorrhage (CRASH-2): A randomised, placebo-controlled trial. Lancet 2010;376:23-32. 70. Oddo M, Levine JM, Frangos S, Carrera E, Maloney-Wilensky E, Pascual JL, et al. Effect of mannitol and hypertonic saline on cerebral oxygenation in patients with severe traumatic brain injury and refractory intracranial hypertension. J Neurol Neurosurg Psychiatry 2009;80:916-20. 71. Liu-DeRyke X, Collingridge DS, Orme J, Roller D, Zurasky J, Rhoney DH. Clinical impact of early hyperglycemia during acute phase of traumatic brain injury. Neurocrti Care 2009;11:151-7. 72. Jeremitsky E, Omert LA, Dunham CM, Wilberger J, Rodriguez A. The impact of hyperglycemia on patients with severe brain injury. J Trauma 2005;58:47-50. 73. Sharma D, Jelacic J, Chennuri R, Chaiwat O, Chandler W, Vavilala MS. Incidence and risk factors for perioperative hyperglycemia in children with traumatic brain injury. Anesth Analg 2009;108:81-9. 74. Young B, Ott L, Dempsey R, Haack D, Tibbs P. Relationship between admission hyperglycemia and neurologic outcome of severely brain-injured patients. Ann Surg 1989;210:466-72. 75. Lipshutz AK, Gropper MA. Perioperative glycemic control: An evidence-based review. Anesthesiology 2009;110:408-21. 76. Rovlias A, Kotsou S. The influence of hyperglycemia on neurological outcome in patients with severe head injury. Neurosurgery 2000;46:335-42. 77. Bilotta F, Caramia R, Cernak I, Paoloni FP, Doronzio A, Cuzzone V, et al. Intensive insulin therapy after severe traumatic brain injury: A randomized clinical trial. Neurocrit Care 2008;9:159-66. 78. van den Berghe G, Wouters P, Weekers F, Verwaest C, Bruyninckx F, Schetz M, et al. Intensive insulin therapy in the critically ill patients. N Engl J Med 2001;345:1359-67. 79. NICE-SUGAR Study Investigators: Finfer S, Chittock DR, Su SY, Blair D, Foster D, Dhingra V, et al. Intensive versus conventional glucose control in critically ill patients. N Engl J Med 2009;306:1283-97. 80. Billotta F, Caramia R, Cernak I, Paoloni FP, Doronzio A, Cuzzone V, et al. Intensive insulin therapy after severe traumatic brain injury: A randomized clinical trial. Neurocrit Care 2008;9:159-66. 81. Bower WF, Lee PY, Kong AP, Jiang JY, Underwood MJ, Chan JC, et al. Peri-operative hyperglycemia: A consideration for general surgery? Am J Surg 2010;199:240-8. 82. Diltoer M, Camu F. Glucose homeostasis and insulin secretion during isoflurane anesthesia in humans. Anesthesiology 1988;68:880-6. 83. Kitamura T, Ogawa M, Kawamura G, Sato K, Yamada Y. The effects of sevoflurane and propofol on glucose metabolism under aerobic conditions in fed rats. Anesth Analg 2009;109:1479-85. 84. Peterson K, Carson S, Carney N. Hypothermia treatment for traumatic brain injury: A systematic review and meta-analysis. J Neurotrauma 2008;25:62-71. 85. Edwards P, Arango M, Balica L, Cottingham R, El-Sayed H, Farrell B, et al; CRASH trial collaborators. Final results of MRC CRASH, a randomised placebo-controlled trial of intravenous corticosteroid in adults with head injury-outcomes at 6 months. Lancet 2005;365:1957-9.